I'll talk about the Gourd Festival later (like when it actually happens!). 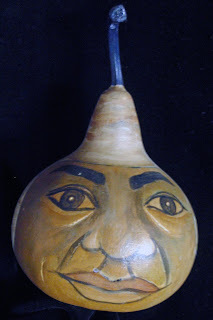 I do want to tackle two questions I frequently get asked: Why do you work with gourds? and How did you get started? Somewhere in the mid-1990's I was an art student by day and taught English as a second language by night. The school I worked for required that I attend an inservice to enrich my teaching skills. I looked at the list of lectures and workshops and was surprised to find an art class. I can't remember the teacher's name but I do remember her tattoos and the gourd she placed in front of me. I held it in my hand and thought how cool it looked, felt, and how the seeds sounded inside, and yes, even the smell! I was hooked and thus began my slow but steady journey into the world of gourds. Above is the first gourd I worked on at that inservice entitled, Peruvian Guy. I'm a native of Denver, Colorado and grew up with a constant view of the massive Rocky Mountains (which I took for granted). Right after college I joined the Peace Corps and lived in Huehuetenango, Guatemala where the lofty green Cuchumatanes Mountains looked over me. Now I live in Southern California where the San Gabriel Mountains aren't usually visible (except on clear and crisp winter days), but nonetheless it is an inspiring place to live! I'm a painter currently using gourds as my canvas. Their odd and quirky organic shapes make me smile and their warmth and visual texture are reminiscent of woodgrain. I only do a few shows a year and spend the rest of my time making special gourd commissions and teaching Art to jr. high students in Orange County.